The ultra-lightweight, 68-Denier fabric is designed to pack down quickly, easily and into its small carry bag. This product is ideal where weight, pack size and speed are of the essence. The fabric has a contemporary Hex-style print to compliment the product’s simple, immaculate design lines. The fabric is exceptionally water-resistant and water will simply bead onto the surface and roll-off. Also, the light-coloured roof material reflects heat to maintain a comfortable temperature inside the awning. The product comes complete with a water-repellent Sewn-In Groundsheet for added protection against the elements. The PVC Window offers a clear, crisp view of the outdoors from the comfort and convenience of your awning; helping to bring the outdoors – indoors. All windows have integral Zip-In Curtains which can be rolled back during the day or zipped-in for complete privacy during the night. There is also a Rear-Cowl Access Door to prevent disturbing sleeping guests and increase ease of access to and from the motorhome. The Ventilation Points help combat condensation by improving air circulation within the drive-away. The drive-away comes complete with Pegs and a Zip-Up Front Door (Velcro at the Bottom of the Doors) to help retain its shape in the wind. 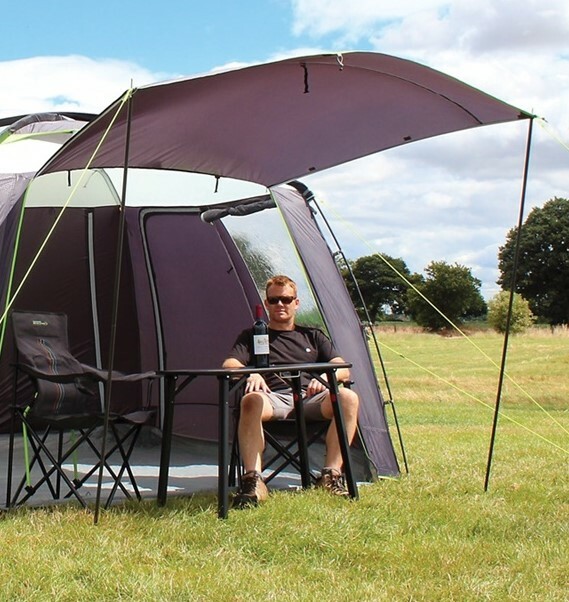 A Two-Berth Inner Tent, Stone Protection Footprint Groundsheet (for added protection against sharp rocks and hard ground) and Canopy Poles (to create a functional, sheltered porch area using the front door) can also be purchased for this product. Cayman Tail which attaches onto the back of a vehicle as opposed to the side. Cayman which is the standard version of the product; fitting vehicles from 180-240cm. Cayman XLF which includes an integrated Two-Berth Inner Tent. The drive-away includes a one-year guarantee against any manufacturing faults. 68HD Hex.Endure Fabric - An Ultra-Lightweight Fabric with a Contemporary Print. Fibreglass Pole Frame - Tough & Hard-Wearing Pole-and-Sleeve Frame. Sewn-In Groundsheet - To Reduce Moisture & Add Convenience. Zip-In Curtains - To Provide Extra Privacy & Make It Feel More Like Home. Single Rear Cowl Access Door - To Allow Entry to the Vehicle Without Traipsing Through the Whole Awning. Velcro on the Bottom of the Doors - To Retain it's Posture In the Wind. 12-Month Warranty - On the Canvas. Perfect For Taller Vehicles - 240-290cm XL Cowl Height. Includes Hook-Up Point - To Power Electrical Appliances within the Tent.